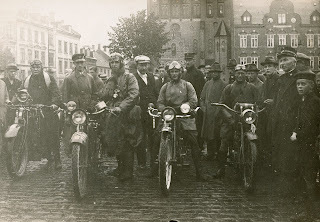 This is a cool photo where some bikers are taking part in a trial roadrun. These trial roadruns where quite popular in the earlier days of motorcycling. Excelsior (Super X), Reading Standard, Indian and Harley. Note the strange round box on the Readings handlebars. I think this is a spare tube container. The bikes front mudguard is filled with plaques from various trials or rallies. 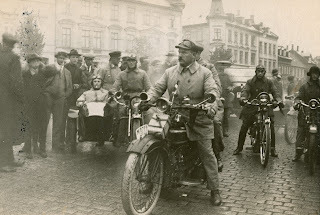 Same contest, what seems to be a sidecar equipped Excelcior in the back of the picture.